Add To Saved Sellers. 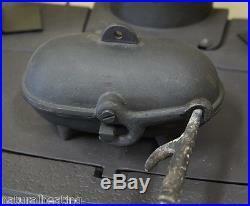 Cast Iron BAKED POTATO COOKER For use on top of wood burning and multi fuel stoves and in open fires! What’s better than a jacket potato? 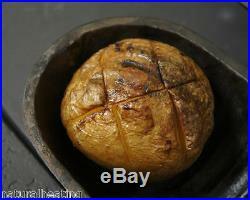 A crispy jacket potato cooked on top of your wood burner or multifuel stove! Our cast iron baked potato cookers are designed to sit on top of all cast iron wood burners and multi fuel stoves – and most steel ones too (though not cool wall units or those with wraparound type back boilers). A hot plate is NOT required – it simply sits on top of your stove. 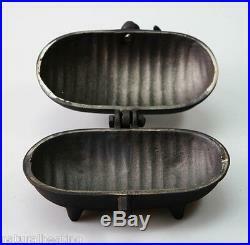 Basically – it makes use of the surface heat, which in turn, transfers to the cast iron pod. 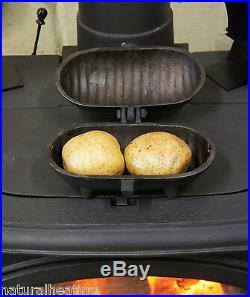 The pod gets hot and evenly cooks your jacket potatoes. It’s also very easy to open to have a look and see what’s happening inside After all, if you already have your stove lit, why bother turning the oven on? It’s not fast, but it’s as green and energy efficient of cooking that you will ever find….. This cast iron baked potato cooker is small enough to fit on top of practically any stove, yet big enough to hold two medium (250g / fist sized) potatoes or one gigantic spud. MEASUREMENTS : 215mm / 8.5″ wide x 160mm / 6.5″ deep x 160mm / 6.5 high The time taken to cook your potatoes is very variable, as it depends on how hot your fire is burning. On the odd occasion we’ve been really busy and forgotten about them, the potatoes have still been perfectly good even an hour or two later. It’s not like wrapping a potato in foil and chucking it in the fire…. (where you end up with something charred on the outside and hard in the middle). If you have ever tried cooking a potato on top of a stove without our pod, they tend to ooze a bit of starch and make a mess of the paint on top of the unit – as well as only cooking from one side. Our pod is not in full contact with the top of your stove however, and as your potato is totally encased in cast iron, this creates a lovely, even bake without the mess. Also ideal for cooking roast chestnuts. On top of that, it looks fantastic too. With potatoes, lightly oil before putting in the pot. Putting some slits in the potato is optional, but does make them cook a bit quicker. This one of the two in the top photo one cooked my colleague had already scoffed the other! 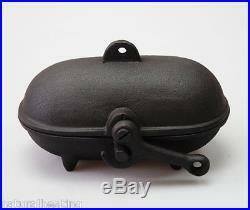 The universal cast iron baked potato cooker has a lever type handle on the front, with a hole in which a poker can be inserted to open if required. The pod also has a little hole on the top – which is for lifting in and out of open fires. Yes – you CAN use on open fires, but do make sure you season this item properly first. It’s fine in small / medium open fires – but keep it out of bonfires and don’t burn wood and coal together NOTE – Your cast iron baked potato cooker requires seasoning before first use. For use on top of wood burning / multi fuel stoves : use a little sunflower / vegetable oil on some kitchen roll and lightly oil inside only. 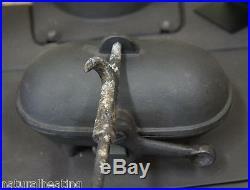 Sit the BPC on top of your stove for at least 2 evenings when the stove is being used before coking for the first time. This is to allow the BPC to get hot enough to bake the external stove paint on to the pot (do be aware the paint may smell as it cures – just as it does with a new stove) For use in an open fire : start with building a small fire. Put the BPC in the fire for approx 15 mins. Remove and allow to cool. Repeat but for 30 mins, then 1hour and 2 hours – each time, removing and allowing to cool. This allows the metal to expand and contract and harden. PLEASE NOTE – BAKED POTATO COOKERS ARE NOT SUITABLE FOR USE ON BOILER STOVES OR STOVES WITH CONVECTION TOPS, AS SURFACE OF THESE UNITS DO NOT GET HOT ENOUGH. _____________________________________ Once seasoned, lightly oil your baked potato and place inside the BPC until cooked. You may turn over during cooking if required. Do not use salt on your BP during cooking in the pod as this will encourage additional draw of moisture and may encourage the BPC to surface rust. The baked potato cooker should never need “washed” – but wipe over if required and lightly oil inside with a sunflower / vegetable oil on kitchen roll (as you would a wok) to protect and prevent rust. ——————————– Help and advice regarding flue pipes, liner, accessories and fittings available. This item will be sent by courier and will require a signature. Items must arrive back in new, resalable condition to the address below within 14 days. It is your responsibility to obtain a certificate of posting for the return from the post office, otherwise you may not be able to claim the post office for it should it not arrive. The item “BAKED POTATOES / CHESTNUTS COOKER Oven use on Woodburning Multifuel Stoves Fires” is in sale since Sunday, February 1, 2015. This item is in the category “Home, Furniture & DIY\Appliances\Small Kitchen Appliances\Slow Cookers & Pressure Cookers”. 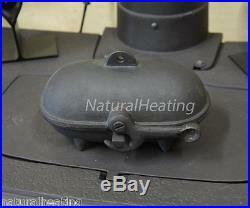 The seller is “naturalheating” and is located in Attleborough / Norfolk & Hamilton / Scotland. This item can be shipped to United Kingdom, Austria, Belgium, Bulgaria, Croatia, Cyprus, Czech republic, Denmark, Estonia, Finland, France, Germany, Greece, Hungary, Ireland, Italy, Latvia, Lithuania, Luxembourg, Malta, Netherlands, Poland, Portugal, Romania, Slovakia, Slovenia, Spain, Sweden, Australia, Canada, Japan, New Zealand, Israel, Norway, Indonesia, Mexico, Singapore, South Korea, Switzerland, Thailand, Chile, Antigua and barbuda, Bangladesh, Belize, Bermuda, Barbados, Brunei darussalam, Cayman islands, Dominica, Ecuador, Egypt, Guernsey, Gibraltar, Guadeloupe, Grenada, French guiana, Iceland, Jersey, Jordan, Saint kitts and nevis, Saint lucia, Liechtenstein, Sri lanka, Monaco, Maldives, Montserrat, Martinique, Nicaragua, Oman, Pakistan, Peru, Paraguay, Reunion, Turks and caicos islands, Aruba, Saudi arabia, South africa, United arab emirates, Ukraine.